Las Vegas, NV – January 10, 2008 – UWB semiconductor performance leader, Pulse~LINK, Inc., today announced that their High Definition video distribution solution has been recognized by Popular Mechanics as one of the best new products at the 2008 International Consumer Electronics Show (CES) in Las Vegas, Nevada. The technical editors at Popular Mechanics awarded its 2008 Editor’s Choice Award to Pulse~LINK’s CWave® UWB technology in the newly debuted Gefen HDMI Over Coax Extender. Out of thousands of new products featured at CES, Pulse~LINK’s technology was selected for its innovation in allowing consumers to enjoy premium quality HD entertainment throughout the home over their existing coax cable. The Gefen HDMI Over Coax Extender is the world’s first consumer electronics product to extend the reach of HDMI connectivity from room to room. It provides an infrared back channel that enables consumers to use the same remote that controls their set-top box, DVR, Blu-ray or HD DVD player, in all rooms throughout the connected home. The no-new-wires solution offers Gigabit data rates and is capable of simultaneous delivery of high quality, visually lossless video along with multi-channel digital audio. It combines the simplicity that consumers want with the guaranteed Quality of Service they demand for a true ‘Digital Home Cinema’ experience. The Gefen HDMI Over Coax Extender is planned for release in April 2008 and will be available online at www.gefen.com or through an authorized Gefen reseller. 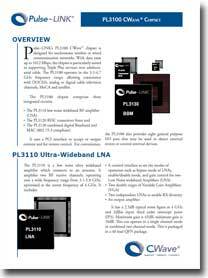 Pulse~LINK is the only semiconductor company to deliver production silicon with Gigabit data rates for both wired and wireless HD video distribution. In addition to the first HDMI-Over-Coax product, Pulse~LINK is also demonstrating the world’s first fully integrated wireless HDMI HDTV at CES with Westinghouse Digital Electronics. Each of these technologies are based on Pulse~LINK’s CWave® UWB chipset, which has been validated in independent testing to have the world’s fastest data rate commercially available for wireless networking. Demonstrations of Pulse~LINK’s innovative solutions for whole-home networking are taking place at the Pulse~LINK booth (South Hall 2, Booth 25559). The PM 2008 Editor’s Choice Awards are posted on the Popular Mechanics website atwww.popularmechanics.com. Pulse~LINK, Inc. is a privately held Delaware Corporation headquartered in Carlsbad, California, with over 300 issued and pending patents pertaining to UWB wired and wireless communications. Pulse~LINK’s CWave® UWB technology, FCC approved and commercially shipping in 2007, is a “no-new-wires” solution that delivers up to Gigabit data rates over coax and wireless networks from the same chipset, providing consumers with the unprecedented ability to distribute high quality multimedia content throughout the home. CWave® solutions support simultaneous operation of 1394, Gigabit Ethernet, and HDMI over coax and wireless connections. For additional information about Pulse~LINK, Inc., please visit: http://www.pulselink.net.